A spacious and bright open plan living room and kitchen fitted with oven hob, extractor fan, fridge-freezer, washing machine, and front window to aspect. The lounge is fitted with an air-conditioning unit, sliding patio doors with fly-screen lead to a private terrace with sea and garden views that simply come alive with beautiful flowers and well-trimmed hedges. At the front of the apartment there is a spacious terrace looking out to the swimming pool/ playground and the mountains. Fitted with a wash basin, WC and bath, and finished with ceramic tiles on the floor and walls. Another double bedroom with fitted wardrobes, wall coves and patio doors, also with fly-screens that lead out to the garden, with views of the sea. A single bedroom with fitted wardrobes and window to the front of the property with pool-side views. Furnished with a wash basin, WC and shower and finished with floor-to-ceiling clean ceramic tiles. In addition to the lovely garden/terrace from the living room that is lined with astro-turf and 2 bedrooms and the spacious front terrace, this wonderful gated development is also extremely well maintained; there are three spacious swimming pools, one with children’s pools and covered wooden pergolas, beautiful gardens, a fully equipped gym, a Jacuzzi and a sauna room.  Beaches nearby: at the front of the complex! Good things come to those who wait, but why wait when you can have this spacious 3 bedroom garden apartment that also sits a few seconds away from the beautiful pool! Being sold fully furnished, this property is an ideal getaway for the Mediterranean lover; a truly tranquil home situated on a complex only minutes from the azure Mediterranean Sea, a variety bars and restaurants and 20 minutes to the 18 hole international golf course. When you step into this bright home, the private garden welcomes you across the open plan kitchen/lounge area, where the sea is visible and the lush hedges provide you extra privacy. Three bedrooms are set on the other side of the property (the Master bedroom with an en-suite bathroom; tub and all) as well as a guest shower room off the lounge. 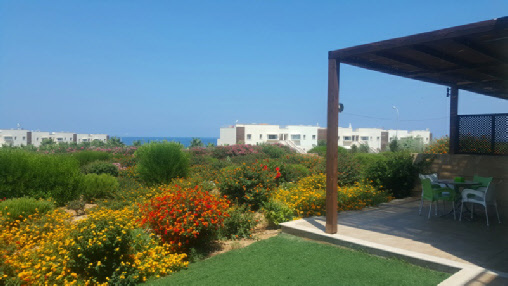 The sea front complex is beautifully maintained and has 3 large communal pools (and children’s pool), a gym, sauna, Jacuzzi, library and free Wi-Fi! The coastline is just a short glorious walk from the apartment and best of all; the owner also has the full title deed in their name….perfection!